A variety of factors need to be considered for accurate measurement of letter chart acuity. This outline discusses the most important ones. What is the preferred chart layout? What should the viewing distance be? What should the illumination be? What symbols should be used? What display method should be used? Beyond the step sizes discussed earlier, another factor that affects the measurement accuracy of letter charts is the number of letters on each line. Traditional charts have a rectangular format. This allows many small letters, but only one or two big letters on a line. In 1976 Bailey and Lovie (then in Melbourne) proposed a new layout, combining the logarithmic progression with 5 letters on every line and spacing equal to the letter size. Their design produced a much wider chart with a triangular array of letters that did not fit traditional letter chart boxes or projector charts. With 5 letters per line the common criterion of counting a line as read when “more than half” of the line is read correctly, becomes 3/5 or 60% correct, about halfway between guessing and 100% correct. In 1982 the National Eye Institute (NEI) needed new charts for its Early Treatment Diabetic Retinopathy Study (ETDRS). They chose the Bailey-Lovie layout and combined it with the letter set designed by Louise Sloan in 1959. These charts became known as ETDRS charts. They have since become a world-wide accepted, de-facto standard. Because of the larger chart size, the NEI protocol reduced the standard viewing distance to 4 meters. Even at that distance, full ETDRS charts require a larger cabinet. Precision Vision was called upon to develop the first commercially viable trans-illumination cabinets and charts for this study. Today these products are still considered the world standard used in research, education and clinical settings everywhere. Since the letter spacing, the number of letters per line and the steps between lines are all standardized, the letter size is the only variable on ETDRS and similar charts. Most Precision Vision charts follow the triangular ETDRS layout; a few charts still offer the traditional rectangular format, mainly for use in traditional cabinets for school testing. All Precision Vision charts follow the logarithmic progression. The MassVat layout and the effects of crowding will be discussed in the pediatric section. Since visual acuity is defined by the angle under which letters are viewed, its measurement can be done at any distance, provided that the scale is adjusted for the distance used. When a letter chart is used as a target for subjective refraction, the viewing distance is important, because the longer the viewing distance, the more accommodation will be relaxed. Snellen’s original charts were calibrated for a viewing distance of 20 Parisian feet (in 1862 more than 20 different feet were in use across Europe). As soon as the Treaty of the Meter was signed (1875) he converted to metric distances and made charts for 5 meter (more convenient with the decimal system) and 6 meter (closer to 20 feet). These distances have the advantage that they relax accommodation and that small forward movements of the patient have a negligible influence. The ETDRS protocol reduced the viewing distance to 4 meters to have a more manageable chart size. For refractive measurements, one must be aware that this distance is 1/4 (0.25) D from infinity and adjust the prescription accordingly. For testing of children a 3 meter distance (10 ft) is often used, since it is easier to keep their attention at that distance. For refractive use, this distance is not recommended. For smaller areas, Precision Vision also produces charts for 2.5 meter and 2 meter. 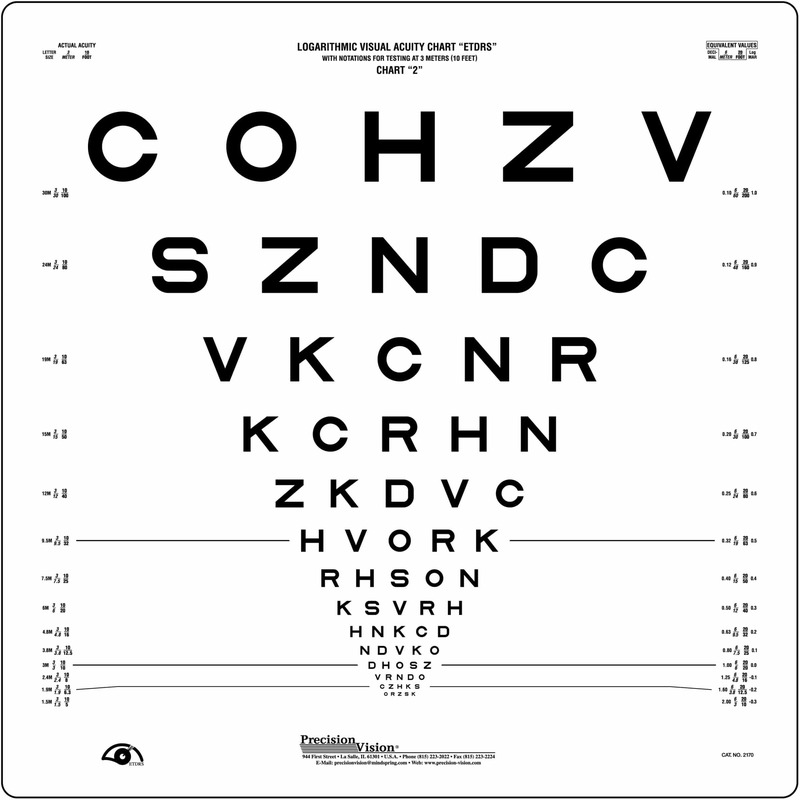 These charts are well suited for visual acuity measurement, but not for refractive use. For testing of Low Vision patients a 1 meter distance is advantageous, since it can cover a much wider range of visual acuity values. The Colenbrander 1-meter chart covers visual acuities from 20/1000 to 20/20. It requires 1 D over the distance correction. Precision Vision offers the Colenbrander 1-meter chart, which folds for easy transportation and has a cord attached to accurately maintain the viewing distance. For testing of reading acuity, various distances have been used. The distance of 40 cm is a commonly recommended standard. To compare the performance of various presbyopia solutions (bifocals, trifocals, progressive lenses, multi-focal lenses, accommodating IOLs) additional intermediate distances are needed. The Colenbrander Mixed Contrast Card Set provides standardized measurements of both high and low contrast letters at 40 cm (2.5 D), 63 cm (1.5 D) and 100 cm (1 D). When the testing distance is short, maintaining the accurate viewing distance becomes more important. At a 20 ft distance, a 1 ft variation represents 5%, equivalent to one letter on an ETDRS chart. At 1 m, 5 % is only 5 cm (2”); at 40 cm it is 2 cm (0.8”). Most Precision Vision charts for use at 1 meter or less have a cord attached to facilitate maintaining the accurate viewing distance. Visibility of objects is determined by their size, their illumination and their contrast. In visual acuity measurement we want to determine a size threshold. We therefore have to make sure that illumination and contrast are at levels where a ceiling effect is reached, so that small variations in illumination and contrast do not influence the measurement. This leaves a fairly broad range of acceptable values. For routine clinical use of front illuminated charts, a rule of thumb can be that contrast should be maximal and that the charts should be illuminated well enough so that extra illumination will not improve the visual acuity readings. All Precision Vision charts are printed on plastic formulated to resist yellowing and with inks that will maintain their blackness. For the Precision Vision trans-illumination cabinets the surface illumination is set at about 170 cd/m2, which is consistent with the ETDRS protocol and falls in the middle of the 85 to 300 cd/m2 range, recommended in the 1984 ICO standard on Visual Acuity Measurement. Before Snellen vision was usually assessed with existing printer’s fonts, which could vary enormously in recognizability. Snellen’s innovation was to design specific characters to be used only for the measurement of visual acuity. He called these characters optotypes and designed them all on Snellen’s 5×5 grid. Although Snellen also experimented with other symbols, he chose letters for his chart since they have most face validity for patients, whose main desire is to be able to read. As explained above for contrast and illumination, we also need to make sure that letter recognition and letter naming are tasks of trivial difficulty that do not confound the size recognition task. If this is not the case, as for young children and illiterate adults, other symbols should be used. Letters are the obvious first choice for adults. Many different letter sets have been used. Since the establishment of the ETDRS protocol, Sloan letters have become the preferred choice. They are designed on the same 5×5 grid on which Snellen designed his letters. Numbers are the second choice for adults. Even illiterate adults can often recognize numbers. Deaf/non-speaking adults can indicate the number seen with simple finger signs. PV numbers are designed on a 5×5 grid and have been calibrated against Sloan letters. Tumbling Es can be used for young children. They are the optotype of choice for many studies in the developing world. Landolt Cs are often used in research studies, but have found limited application in clinical practice in the US. Tumbling Es and Landolt Cs offer four alternative directions; a prerequisite is that the subject can duplicate this direction, which may be a problem for children with a young developmental age. Children who are too shy to respond verbally, can be asked to match the letter or optotype to one of four flash cards in front of them. For some this is easier than indicating a direction. HOTV charts also offer only four choices. The four letters H, O, T and V have been chosen because they are R/L symmetrical. Numerous picture cards have been designed. A problem is that not all children are equally familiar with all pictures and that many picture sets have uneven difficulty. Most pictures cannot be designed on a 5×5 grid. Patti Pics are stylized pictures designed by Precision Vision on the basis of the 5×5 Snellen grid and calibrated for equal recognizability against Sloan letters. Visual acuity readings should not change appreciably when children are advanced from Patti Picks to a regular letter chart. Precision Vision offers charts with all of the above optotypes: Sloan letters, PV numbers, tumbling E’s, Landolt C’s, HOTV and Patti Pics. The opaque printed chart is the oldest format. It has the advantage of easy transportability. It is the preferred format in offices where visual acuity is only measured occasionally or for school screenings where the venue often changes. For each setup, care must be taken that the viewing distance conforms to the distance for which the card has been labeled. Translucent charts need a special illuminator cabinet. When that cabinet is available, they have the advantage of a standardized light level that is largely independent of the room illumination. Precision Vision provides a small cabinet that is easily moved from one location to the next and a large cabinet that accommodates the full ETDRS chart format. The large cabinet has a rolling stand to move it to different distances from the patient, but it is less easily moved from office to office. Projector charts are the choice of most eye care professionals for use in the office. Since most rooms are smaller than they were in Snellen’s days, the fixed installation usually involves a mirror to increase the viewing distance. Since the projector lenses are adjustable, care must be taken that the letter size on the screen is adjusted for the actual viewing distance (patient to mirror + mirror to screen). Since most examination rooms are only semi-dark, care must also be taken that there is no stray light reaching the screen, since this could seriously reduce the contrast. Precision Vision provides projector slides with various optotypes in a logarithmic progression. In recent years computer displays have replaced many projectors. Such displays have several advantages: Optotypes and a wide variety of display modes can be changed with the click of a button on a remote control. The screen is less sensitive to stray light. Presentations can be switched from a fixed letter sequence (easy for the doctor who knows it by heart) to a random sequence for patients who have been tested quite often. As with projector charts, the letter size on the screen must be coordinated with the actual viewing distance.